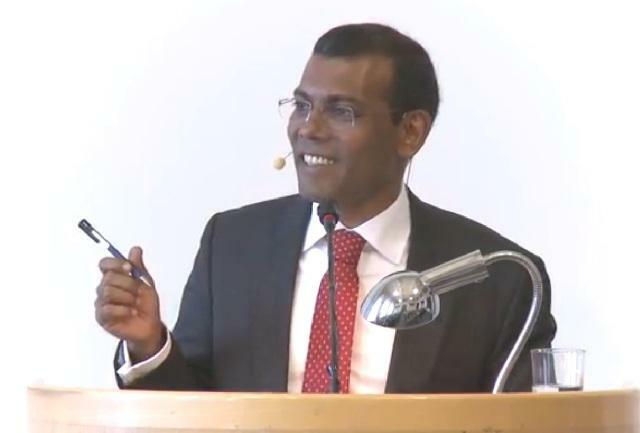 A question that Nasheed answered during a Q&A session while in Denmark recently has become a topic of much controversy, of course stirred by none other than those who are so “moved” by Islam that they cannot or are not willing to understand the fact that extremism is not the version of Islam that Prophet Muhammed (PBUH) has preached and left behind as a legacy to all of us to be blessed with Allah’s love and good things in the Hereafter. It was a tweet by Mr. Bushry, the former editor of Monday Times; a man I respected deeply as a journalist and his ability to keep readers interested with his articles (I still remember looking avidly forward to each article that was published back then and I am most certain I have never missed out on reading anything that he published back then) that brought this video link to my attention. Maybe I am just dumb or maybe the version of English language that I understand is not on par with what Bushry and the likes have studied, but what I understood from the video clip was that Nasheed adressed the point of rising extremism as an issue that exists in this country together with many other countries in this region. Maldives being a “100%” Muslim country, the vulnerability factor here is a just a tad more, which is of course true if you look at what has happened in the past and what is happening even now. If you take into account the direction in which Imran and the lot are trying to move this nation i.e. by preaching their hypocritical version of Islam, extremism & radicalism is what is going to be the end result of this all. And of course if you take a look into the bombing that took place in the Sultan Park together with the Himandhoo issue, both of which came up during Maumoon’s 30 year golden era, one cannot turn their back on such glaringly obvious evidence unless they choose to be blind, which is of course another matter altogether. What Nasheed said was that a different dialogue that preaches true Islam to the people needs to come out. Which is certainly true because there are very few scholars who actually preach what they practice without sounding like envoys sent from up above to judge people based on their actions and decide then and there who and who are ordained for Paradise and Hell. Nasheed corrected himself after using the term “liberal Islam” saying that a better way to put it would be the “correct version of Islam” and the fact that this dialogue needs to be established is the unvarnished truth. I believe that Nasheed makes a valid argument based on that point. Extremists use and exploit religion to their own advantage. Religion is a means to an end to them, most of them dreaming about the 70 virgins they would be offered the minute they strap explosives on their body and go blow up something killing 1000’s of innocent bystanders in the process. That is not the form of justice that Islam talks about. Islam is a religion that advocates peace above all else. A just and fair system for its followers and those that do not follow it, a society that can live in harmony, even be it when there is a mix of people who follow different religions. Such is the way of Islam, it is not a religion based on beheading each and everyone that emerges with a different school of thought from yours and it is certainly not about enslaving and brainwashing people into submission. Above everything else Allah SWT has given us free will and that choosing to live the way we do is something He alone can judge and to that there is no question. Nasheed’s point of extremists using religion to their advantage is valid and the example he took to drive home the point was what seemed to have stirred all this controversy. The example that extremists always have an answer for everything. Even if one cannot sleep at night, they would quote a Hadith and an Ayat from Quran and then the person would go back to sleep again. This is in no way a mockery to any of the teachings in Islam and I cannot find anything blasphemous in nature in what he said. He did not mock Islam, nor did he mock the Sunnah laid out by the Prophet Muhammad (PBUH). Anyone who has a good command of the English language and can THINK for themselves without getting all defensive about their personal hatred towards Nasheed would indeed understand his point. Me, I’d rather have a leader who sees the problems that exists in this society than bury his head in the sand like an ostrich & goes on to prevent others from seeing and facing the reality of the society that we live in today. Reality is that even the much “revered” Maumoon Abdul Qayyoom himself had agreed to the rising elements of extremism on this soil during conversations he had at the American Embassy based in Sri Lanka as per the documents leaked on WikiLeaks. Truth is extremism if not curbed, if a solution not found, is a ‘virus’ that will continue to breed, multiply and the resultant wound fester beyond control which would result in us reverting back to the dark ages where education is a thing of the past, where women become enslaved and our children grow up to be ignorant in a way that would bring nothing but despair raining down upon us. For once, stop the hate mongering TV channels and newspapers from feeding those little tidbits into your brain and do the actual thinking for you. For once in your life, STOP and THINK! It just might change how you see things which in turn might pave the way for a better future. An important point to ponder upon meanwhile is the fact that actions are judged by our intentions. And be it me, you or Nasheed, we would all be judged for our actions, our deeds and the way we have conducted ourselves in the Hereafter. Allah knows best. What you have written is the reality in every sense of it.yes, we have extremist movements actively propagating their ideology. Now what’s happening in Pakistan is the clear result of allowing these movements to operate in. Every day more people are killing by suicide bombers. In this country that day won’t be a distance future if this continues. So true. And I am afraid that’s the direction we are headed if we do not take proactive measures now. Islam means peace and submission. Submission to Allah. Not the sheikhs! Truly. Something more people should learn and start practicing. Liberal Islam is the correct way of Islam. Islam offered freedom to slaves, liberation from barbaric acts of the jahiliya era and hope for a people who were barely a civilization. Islam also allowed freedom of religion in a time when refusing to worship stone idols was cause to be tortured and killed. These mullahs want us to live in poverty while they enjoy free trips to Thailand for bab fil masaaj. These ‘ulema’ are no different from the pagans of the Qureysh; their idols are not of stone, but oil money. Liberal Islam is the true islam.